Have you ever experienced a burning, itchy, and/or sensitive scalp while getting your hair colored professionally, or attempting to color your hair yourself? You may have tried several other hair color brands just to see if it would correct the problem. This may come as a surprise to many of you, but using a very simple and inexpensive product that we all are quite familiar with; Sweet N Low. Yes, as in the artificial sweetener, is the solution to these dreaded sensitivities. So, you're thinking, how is this possible that an artificial sweetener can relieve itchiness and burning on the scalp due to hair color? Well, let's start with the two main components of permanent hair color, which consists of ammonia and hydrogen peroxide. The ammonia's purpose is to break down the hair cuticle enough to where the color can penetrate. And, the hydrogen peroxide 'develops' the color. Permanent hair color generally has a ph level around 11 (Alkaline), which is fairly high. 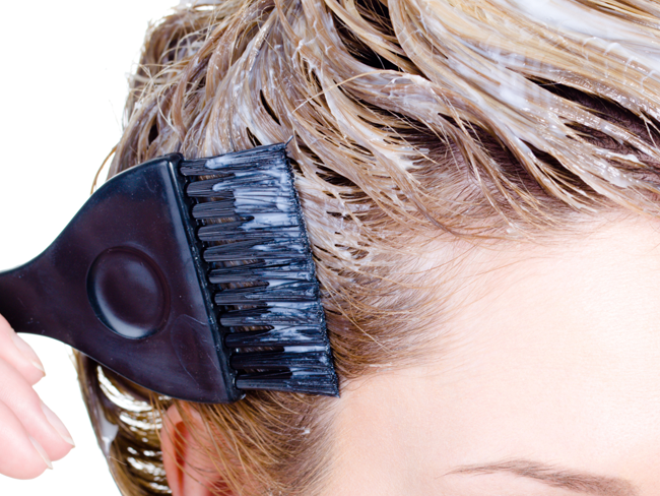 So, it's not surprising that hair color could cause scalp and skin irritations. All of these ingredients have a very low pH, which makes Sweet N Low neutralize the high pH of hair color. As a result, giving your scalp and skin relief from irritations. No, it will not make your hair sticky, or affect the result of your color. So, when do you add Sweet N Low to your hair color? After mixing both your hair color and developer in a mixing bottle or bowl, add 1-2 packets of Sweet N Low. Mix, and apply hair color as you normally would. Does this really work? Well, I can speak from my personal experience as a hairstylist, and from other fellow hairstylists through the years, that Sweet N Low really is the secret! Did you know that brushing your hair prior to receiving a color service may cause your scalp to become irritant during, or after your color?I believe it’s well worth suggesting this little Sweet N Low trick to your hairstylist or colorist the next time you have an appointment if you have a tendency to get an irritated scalp. You won’t have to resort to letting those natural grays come through discovered just yet! This simple solution has many wondering why wouldn’t manufacturers formulate something like this in the first place?! Although, some have begun to add an ingredient, ethanolamine, to their hair color products that works very similar to Sweet N Low. Oftentimes, ethanolamine will be an alternative in ammonia-free products. Note that some permanent hair colors contain PPD (paraphenylenediamine). This ingredient provides a natural-looking result, but also harsh enough to warrant cautions. However, only a 6 percent dosage of PPD is allowed in hair colors. If you are allergic to hair color that contains PPD, unfortunately the Sweet N Low trick is not going to work.